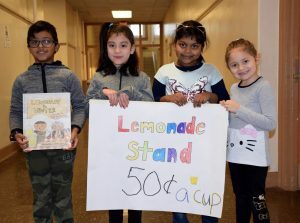 Covert Avenue School first-graders and members of the Student Council worked collaboratively to run a lemonade stand during their lunch periods as a fundraiser for Alex’s Lemonade Stand Foundation, a pediatric cancer charity. The first-grade classes read the book “Lemonade in Winter” before the day of the sale. The book tells the story of two siblings who open a lemonade stand in the coldest time of the year despite their parents’ objections. 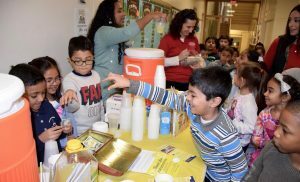 During the event, students collected money and handed out cups of lemonade and napkins to their customers. 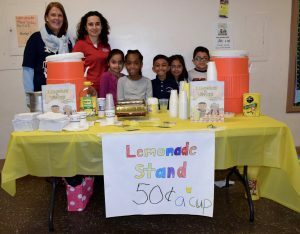 Principal Mary Natoli extended her thanks to the first-grade students’ families, who generously donated lemonade mix, napkins and cups to ensure the sale’s success. The sale raised $400 for the organization, which included a $75 donation from the Student Council. Covert Avenue School first-graders made and sold lemonade to their peers to raise money for Alex’s Lemonade Stand Foundation. Covert Avenue School first-graders (from left): Micah John, Lacey Lopez, Kaarunya Yasotharan and Sophia Collett are pictured with a poster created for the sale. 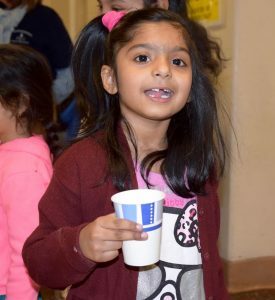 Covert Avenue School student Ume Kulsoom Muhammad smiled after purchasing lemonade during lunch. Covert Avenue School Principal Mary Natoli and first-grade teacher Concetta Moryl are pictured with students (from left): Fatima Raza, Ayannah Bertrand, Tristan Gulamadeen, Keely Harinandan and Elvin Maldonado.